Luxurious and affordable 2-bedroom condo. Private hot tub. This 2-bedroom condominium will exceed your expectations in luxury at an affordable price. The condominium includes upscale amenities such as a fireplace in each room, a private balcony with your own hot tub, full kitchen and heated bathroom floors. One of the best features of this condominium is that it is located on the corner of the complex; therefore, offering more windows to view the mountains with, when compared to many of the other condos in the development. Additionally, it is conveniently located to all the local attractions of the Park City area. Having a car is optional. 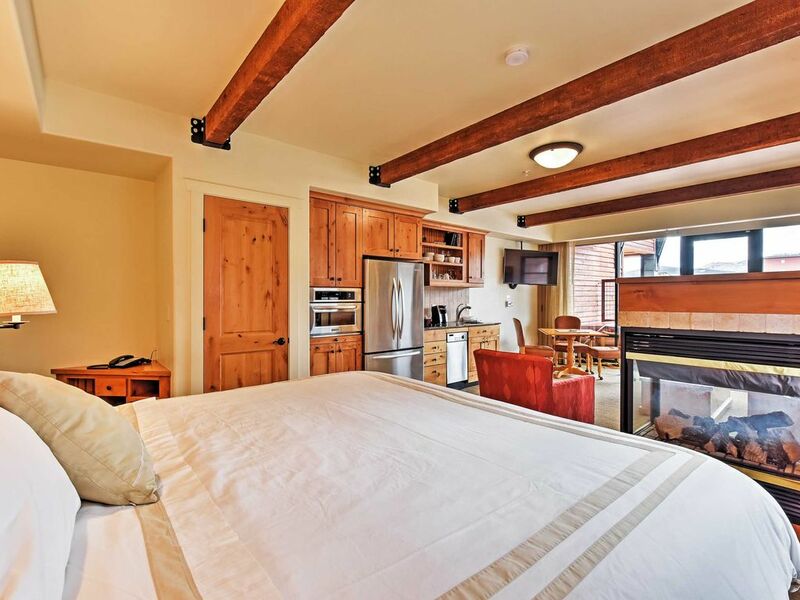 We take pride in making sure your accommodations exceed expectations while you enjoy all that Park City has to offer. Private balcony with your own hot tub. King and Queen bed with 2 queen sleeper sofas. Master bath has a separate shower and a large soaking tub. Access to indoor/outdoor heated swimming pool, fitness center, steam room, and sauna. NO additional 6.5% resort fee to use these resort amenities. Walking distance to shops, a movie theater, restaurants, bowling alley / family fun center, groceries stores, coffee shops, ice cream stores and a nature preserve. During the summer sit out on the balcony and enjoy the music from the free concert series in the common area below. A ski/bike rental facility and a spa are located on-site. The Park City bus line service offers free bus rides to downtown Park City and all the ski resorts in town. The bus stop is located in front of the building. Located 35-minutes from Salt Lake City International airport. We take pride to make sure your accommodations exceed expectations while you enjoy all that Park City has to offer. Cleanliness is a priority. Location is great. Beds are super comfortable. Bathrooms are luxurious. Views are wonderful. Bathroom-1: Heated floors; Granite counter tops; Soaking master tub and separate shower. Bathroom-2: Heated floors; Granite counter tops; full size tub and shower. End unit. Great view of the mountains. Full size stainless steel refrigerator, stove, microwave, dishwasher and granite countertops. For additional convenience, the 2nd bedroom is considered a private “lock-off” unit and has a kitchenette area with a mini-refrigerator, sink, microwave and coffee pot for added comfort. In pool area. Also has a seperate steam room. Great location. Excellent responsiveness from the owners. We will return. Perfect stay, wonderful amenities, great location! This is our 4th year back in Park City and I'm so happy we finally found a place we'd be willing to stay again. The location is super convenient to restaurants, shopping, etc. It was only a 15 minute drive daily to Deer Valley, but totally worth it to stay in a modern and spacious condo with plenty of space for our family of 4 to stay. It was nice to be minutes from tubing and sledding areas. And having a Walmart across the street was convenient. The location of this unit- 2nd floor but immediately above the pool and super close to the lobby- was ideal. The unit is spacious and clean. The fireplaces were beautiful and kept us warm and cozy. The beds were seriously the most comfortable beds I've ever slept in on vacation. The hot tub on the balcony was a fun treat for the kids. It's small but still fun and relaxing. Tim was a pleasure to work with- he was very responsive and made sure our stay went smoothly. Located in the famous Park City mountain resort area, this condominium is in a new and growing area of Park City which offers all the beauty and excitement of a vacation town. Both winter and summer activities are abundant and conveniently located. The condominium is located in the Newpark Town Center to provide all the essentials to make your stay comfortable and exhilarating. Golf: Park City (7-minutes). Many others within 30-minutes.